Mona Kuhn’s (German, b. Brazil, 1969) photographs of nudes aim to show the human body in its most natural state. Stripping away the distraction of material adornment, her subjects become timeless and free from cultural and/or generational stereotypes. A sense of comfort permeates each photograph; the subjects feel safe and at ease, allowing a genuine conveyance of emotion. She begins each series with a specific color palette in mind, followed by an emotion. Then she chooses a location, and lastly her subjects. Working intimately with a group of friends, she considers each photograph a collaboration. The subjects’ postures mirror their environments and each series flows like a lyrical ballad, opening up a dialogue about the human body’s interaction with the setting. Classically trained, Kuhn’s compositions are painterly studies, each photograph thoughtfully arranged. Each image is multi-dimensional with a careful selective focus, giving the viewer the opportunity to only enter specific areas of the frame and leaving the remainder up to the imagination. Mona Kuhn was born in 1969 in São Paulo, Brazil and is of German descent. She received her BA from The Ohio State University and went on to study fine art at the San Francisco Art Institute. Her work is in private and public collections worldwide, including The J. Paul Getty Museum, California; George Eastman House Museum, New York; Museum of Fine Arts, Houston, Texas; Musée de l'Elysée, Switzerland; Musée de la Photographie de Charleroi, Belgium; Hiroshima Peace Memorial Museum, Japan; Los Angeles County Museum of Art, California; The Louvre Museum, Paris, France; Pérez Art Museum Miami, Florida; and the Buhl Foundation, New York. Steidl has published four monographs of Kuhn’s work to date, Photographs (2004), Evidence (2007), Native (2009), and Bordeaux (2011). 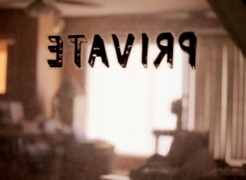 Her newest monograph, Private, also published by Steidl, will be released in the Fall 2014. 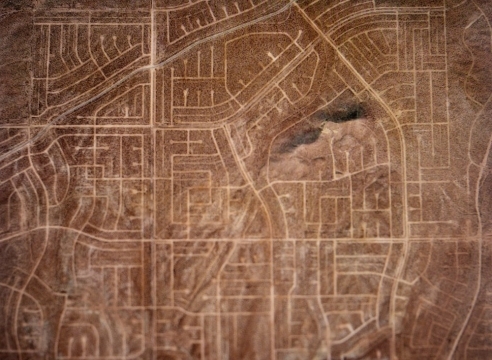 Kuhn’s currently lives and works in Los Angeles and is an independent scholar at The Getty Research Institute. Join Hasselblad and Musée Magazine’s Editor-in-Chief, Andrea Blanch, as she hosts an Artist Talk, featuring Mona Kuhn, Rachel Perry and Molly Soda. 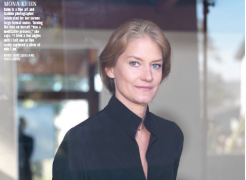 Sponsored by Hasselblad in partnership with Musée Magazine, the panel will be moderated by writer Carol Kino. The three artists all explore, in their unique contrasting styles, the visual representations of the female body in art and the manipulation of perspectives to create psychological intrigue. These artists will show their work and come to talk about their creative processes, related to representations of women now. Los Angeles seems literally made of light. Most days, an unbroken blaze shines down from cloudly skies were palm trees casually sway, casting every detail of the city's surfaces in forensic focus until they eventually disintegrate into the pink-hued explosion of sunset... Mona Kuhn, a German-Brazilian transplant to the city, often works at the intersection of light and architecture. 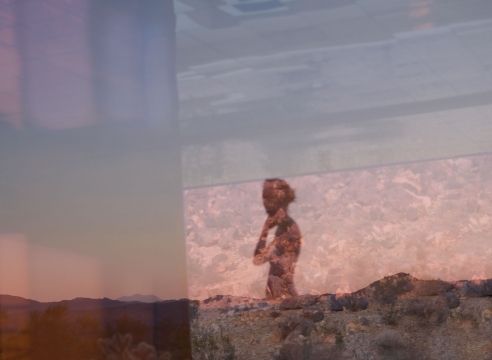 In her series, She Disappeared into Complete Silence (2014) (which draws its name from Louise Bourgeois's first monograph), the lines and shapes of an anonymous house frame images of a desert setting. A sharply angled overhang looks out toward a graph of mountain ranges and cuts a black triangle across a swath of sky. Watery reflections undulate beneath a room's blurry scaffolding, and refracted doorways lead to the arid earth outside. Mirrorlike, silverly folds and a spectral figure recur, beacons in an ominous landscape. 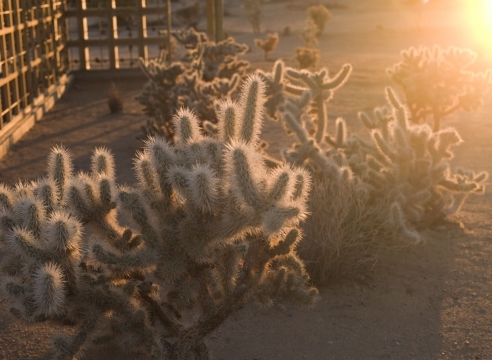 Shot in a modernist-structure built by architect Robert Stone outside Joshua tree National Park on teh fringes of LA, Kuhn's images are mirage-like, visions borne of a thirst for otherworldliness. Acclaimed for her intimate nudes, Mona Kuhn takes a new direction into abstraction in her latest series, She Disappeared in Complete Silence. 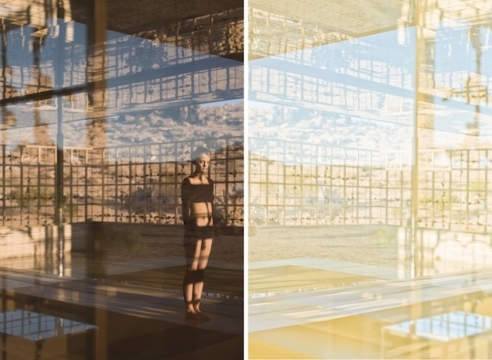 Photographed at a golden modernist structure on the edge of Joshua Tree National Park, architectural lines, light reflections and a single figure have been carefully balanced against the backdrop of the Californian desert. She Disappeared in Complete Silence marks Kuhn’s increasing use of techniques that appear to merge the figure, abstraction and landscape into one. Mona Kuhn featured in "A Handful of Dust"
I am happy to report that the newly installed edition of the Photography Show presented by the Association of Independent Photography Art Dealers at Pier 94 is quite spectacular. There were many, myself included, who were very attached to the idea of this reliable warhorse being held in the Park Avenue Armory. Something about the enclosed, cozy space was familiar and intimate. The idea of the Pier could have rendered it cold and impersonal. The good news is that the lightness and extra space actually gives the galleries and the work more room to breathe. The work of female photographers is being sought and collected more than ever. We asked seven to make self portraits that show what others see in them -- and what they see in themselves. Billboards dominate the landscape of Los Angeles. A vast sea of signs greets commuters each day with an onslaught of commercial messaging. 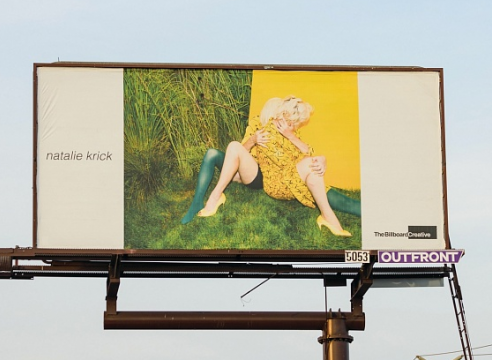 The Billboard Creative offers an alternative: art replacing advertising, for an entire month, at some of the busiest intersections throughout Los Angeles. Several photographers presented large-scale scenes that opened a window into their own dreams. Their photographs played with the logical assumption that an image must depict the real, and instead provided the viewer with an escape from reality. Los Angeles-based photographer Mona Kuhn showed several colourful images featuring models enjoying a classical, Dionysian garden scene, as though taken from a dream. Mona Kuhn is best known for her large-scale, dream-like photographs of the human form. Her work often reference classical themes with a light and insightful touch. Kuhn’s approach to her photography is unusual in that she usually develops close relationships with her subjects, resulting in images of remarkable naturalness and intimacy, and creating the effect of people naked but comfortable in their own skin. She has recently been the judge of The Human Bodytheme for Life Framer. In the spring of 2004, Gerhard Steidl, the German publisher came to LA to work with my brother Ed Ruscha on a book project documenting Hollywood Blvd. After a full day of shooting that street, we all went to Musso & Frank’s Grill, Hollywood’s oldest restaurant. Gerhard told me that we should allow an extra chair at our table as he was expecting to have the photographer of a new book he was publishing to come from San Francisco and join us. Gerhard is a multi-tasker who meets with many artists who are preparing to print their books with him in Steidlville – his publishing empire in Göttingen, Germany. He allots specific times to discuss ideas with the artists, usually during the production of his many other projects, so his timing is always short and precise, and one is lucky if given more than a few concentrated moments to clarify their presentations with him. I ordered my meal, and a bit later a beautiful woman appeared behind me. Gerhard stood up and they spoke German briefly as he embraced her, and I got up and hugged her, too, as it seemed like we’d known one-another for a long time. Gerhard repeated her name – Mona Kuhn – and she sat down next to me and from then until we finished dinner, we never stopped talking. She was a force of energy I hadn’t experienced in a long time, and I therefore welcomed our initial acquaintance, and said I truly hoped to see her again. Then we all bid a reluctant goodnight to her. 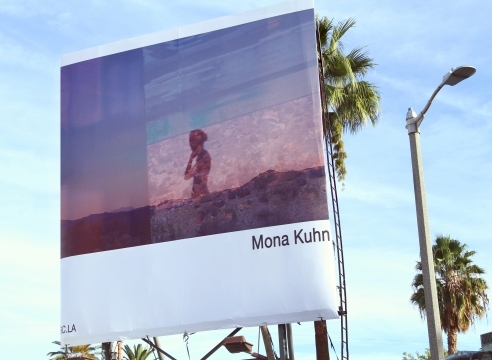 It’s an exciting moment for artist Mona Kuhn. She has two new series coming out at the same time. “Acido Dorado” opened last week at Flowers Gallery, Kingsland Road in London. And this week during AIPAD in NY, two galleries will be previewing her upcoming series titled “Private”, Jackson Fine Art and M+B. 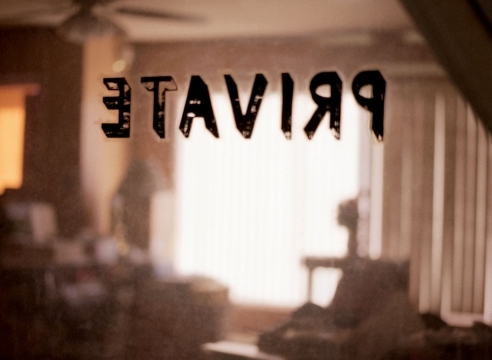 Steidl is printing the accompanying book in May, to come out in early Fall as part of Paris Photo. A sense of comfort permeates each photograph; the subjects feel safe and at ease, allowing a genuine conveyance of emotion. She begins each series with a specific colour palette and emotion in mind, then she chooses a location, and lastly her subjects. Working intimately with a group of friends, Kuhn considers each photograph a collaboration whereby postures mirror environments and open up a dialogue about the human body’s interaction with the setting. Mona Kuhn's latest series Acido Dorado takes its name from the high altitude desert at Joshua Tree in which the pictures are taken. The work is saturated with the light that is particular to SoCal. Kuhn's main focus is on the beautiful Jacintha who she has been photographing for the past ten years. This special relationship is evident throughout the exhibition. The tranquil ambience and Jacintha's sensual body add more mysteries to the photographs, which create a pathway for the viewers to reach a contemplative mental state. In addition, Mona's new book, Private, has just been published and the first print editions arrived at Edwynn Houk Gallery during the opening night. The book will be available at Amazon soon. Mona Kuhn's first studies in art were charcoal drawings, and her photographs retain a loose, freehand feel, often forming meditations on light and shadow. Influenced by the frank intimacy of Nan Goldin, she uncovers vulnerability with a tenderness that mutes its dangers.